A new standard in hydromulch has arrived. EnviroMatrix ECM is the fast acting, ultra-potent brainchild of Australia’s leading soil scientists. For lasting revegetation, our hero product blends 22 specially selected strains of beneficial bacteria and fungi with other essential nutrients. Treatment is designed to restore highly problematic soils that are very low in carbon. Ideal for revegetating all areas including extreme slopes. Powered by the Troforte application method, EnviroMatrix ECM is proven to restore carbon levels in severely depleted soil, even on the steepest slopes. It is best described as an innovative hydraulically applied Biotic Growth Medium. 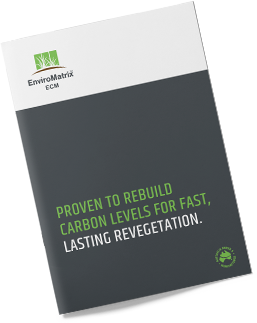 revegetation results, download the EnviroMatrix ECM brochure.